WHILE many children eagerly awaited the Easter bunny before Easter, students of St Ita’s Catholic Primary School were more “egg-cited” about the hatching of their final fundraising total for Project Compassion. 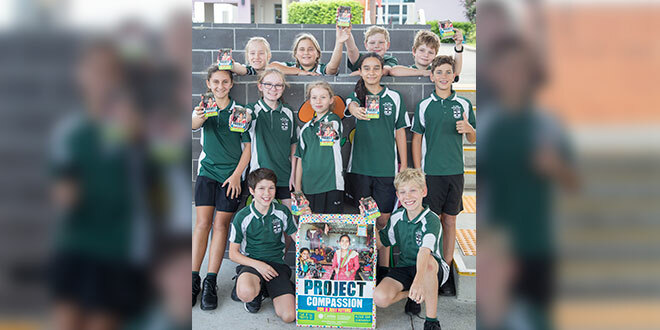 After raising $2150 for Caritas Australia last year, the Dutton Park primary school banded together to surpass this year’s Project Compassion goal of $2500 with an impressive total of $2521 by March 28. “We are so excited, and the kids are too,” assistant principal Paula McConnon said. The fundraising quickly became competitive among the classes once a small reward was on offer, inspiring Year 6B to raise the most money for Caritas in the school, raking in $249.85 overall. The student social justice ministry, which is run by a small group of Year 6 students, majorly contributed to this success with its creative ideas. “For Project Compassion, we wanted to make it bigger and better than last year, so we decided to write a rap and make a coin challenge,” student ministry member Amira Geurgis-Brown said. According to the student ministry, the “dollar coin challenge” involved encouraging the whole school to bring in as many dollar coins as possible and the class that formed the longest line of their combined coins would win. The Prep students gave the older children a run for their money by winning the dollar coin challenge with a line reaching 2.5m. The student ministry also kept morale hopping along with an offer that was too good to refuse. If students reached their fundraising goal, they would watch their school principal Greg Cran perform the student-written Project Compassion rap in front of the school, while sporting a tutu and bunny ears. “As a community in this school, we are trying really hard to raise a lot of money for those who are poor, but we make up fun things for us to enjoy it,” ministry member Sofia Barragan Jimenez said. Despite their financial strategising, these 11-year-olds are far from money-hungry, displaying a greater appetite for justice. Another student advocate of social justice Kane Price echoed the fundraising vision of his peers. The final fundraising total was announced at the school’s assembly on March 29, following their Easter liturgy and student re-enactment of the Passion of the Christ.